This time of year is full of sound and motion. You can hear the running of tiny cascades as melting snow runs down between the rocks on the hills. The ice road is closed and water on the lake starts moving as its blanket of ice thaws. Children begin to appear in numbers in the parks, where they swing, slide, shriek and laugh with abandon, or go running after footballs, running after each other, or simply running. The birds return and fly around in flocks, or congregate on the ground and peck at the wet earth. I don’t know if they’re pecking at grubs, or worms, or merely at shiny things. But whatever they’re doing, they make a lot of noise while they’re at it. It’s as if they’ve run into old friends after a long time apart and they’re socializing and catching up on the latest news. On the streets the runners appear, zooming by, appearing seemingly out of nowhere, both individuals and groups. Unshackled from their heavy parkas and coats, the pedestrians move more freely. The cyclists take their bicycles out of storage and go pedalling around town, some with children in tandem. Although most of the snow has melted and the streets are now dusty from the leftover winter gravel, there are still remnants of snow and ice where it was heavily packed, or in shaded areas. 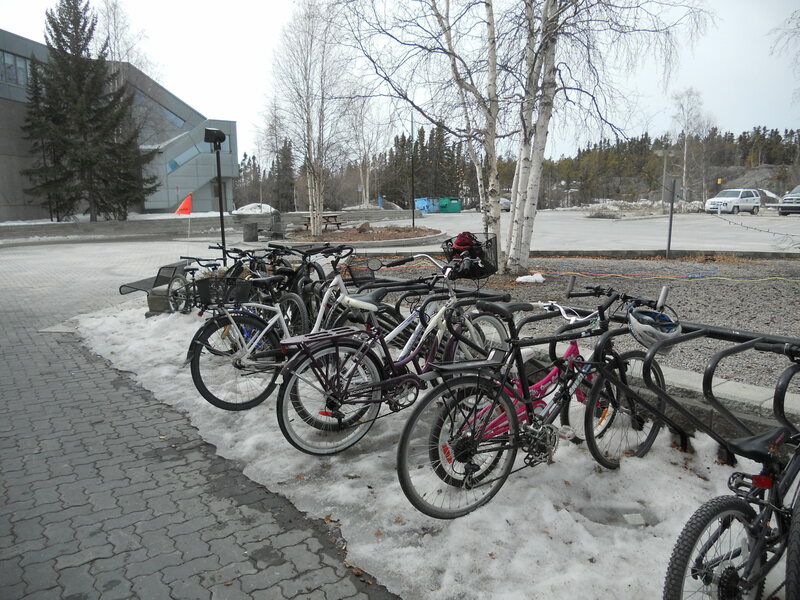 If you do your errands on your bike, on the same day you can park it on concrete, in mud or on ice. 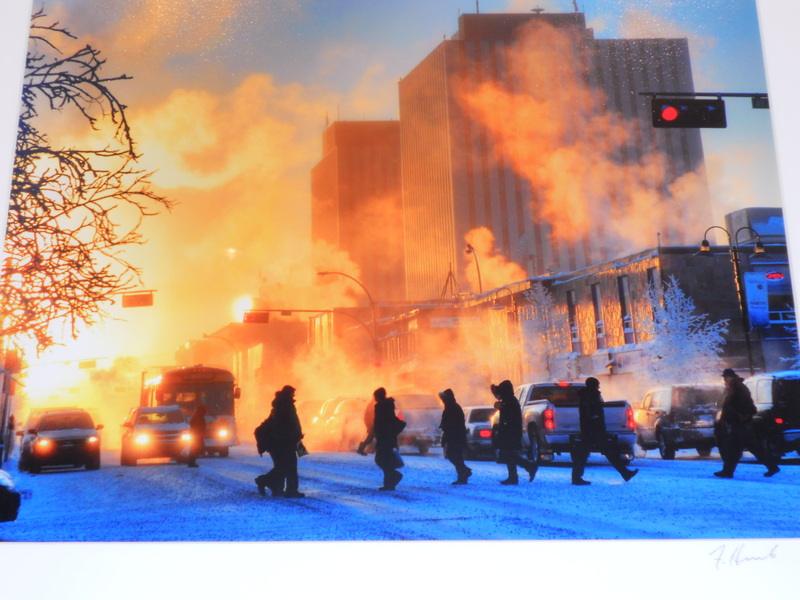 Every day, you can snap a photo of something that is typical of life in this town, or typical of northern living. 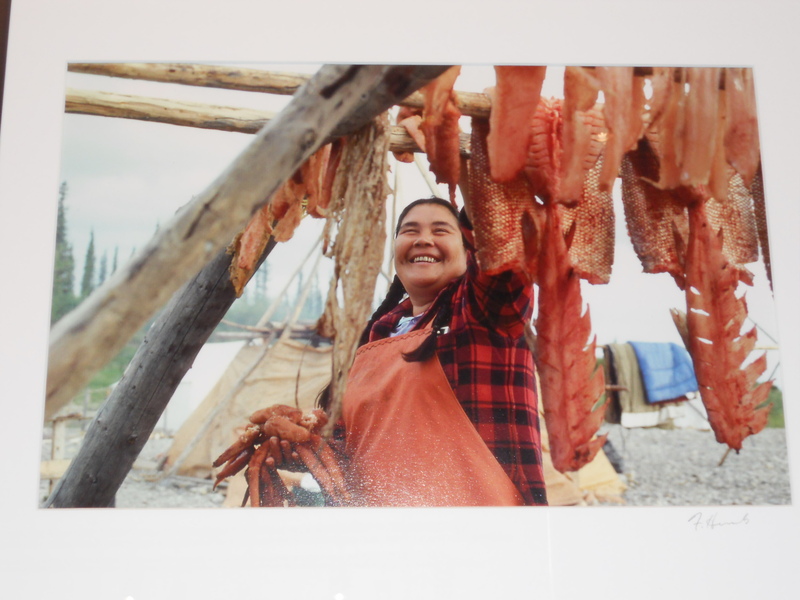 That’s exactly what photographer Fran Hurcomb did: take photos of life in the Northwest Territories (and elsewhere) and some very good ones at that. 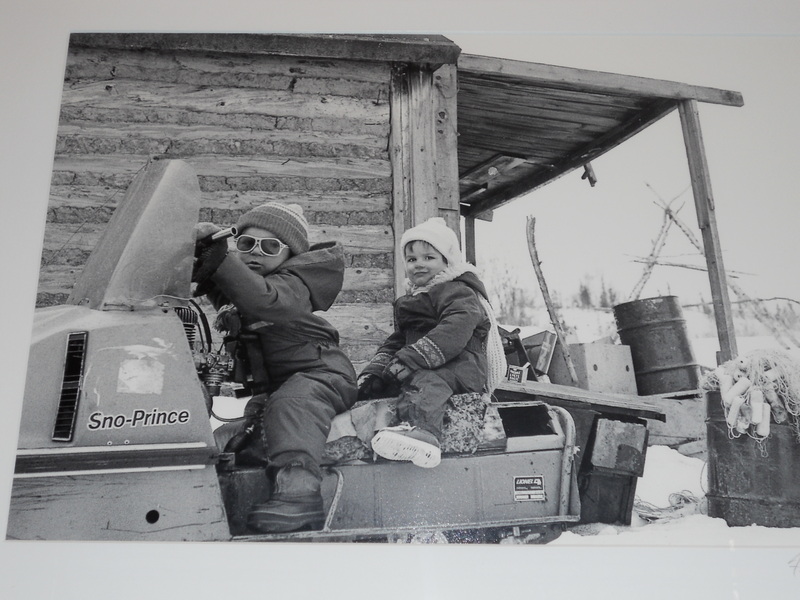 Her exhibit, called “What I Saw: 40 Years of Northern Photography” went on display this month at the museum. 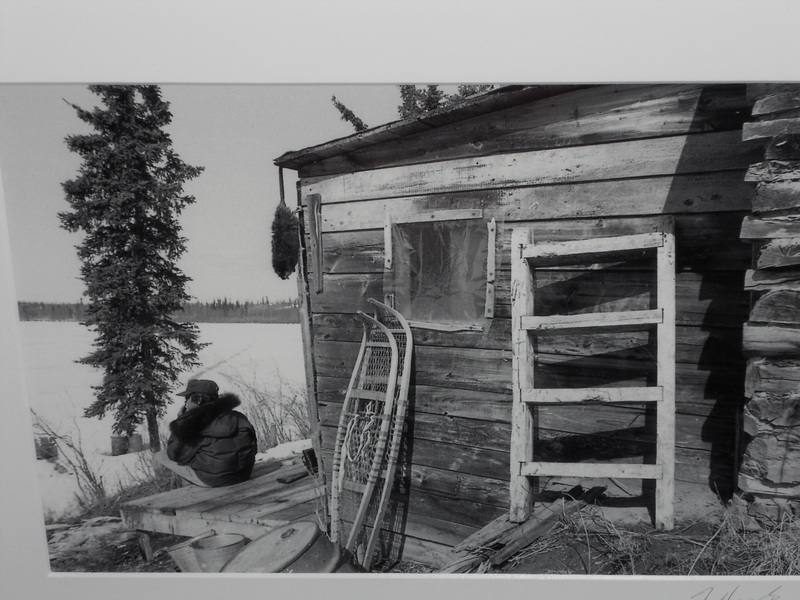 There are scenes that reflect both the simplicity and the extremes of life in the north. Here people still hunt and fish for food, not only because the prices at the grocery store are high, but because they choose to live that way. It’s perfectly natural to see racks of fish being dried. Nothing is wasted. 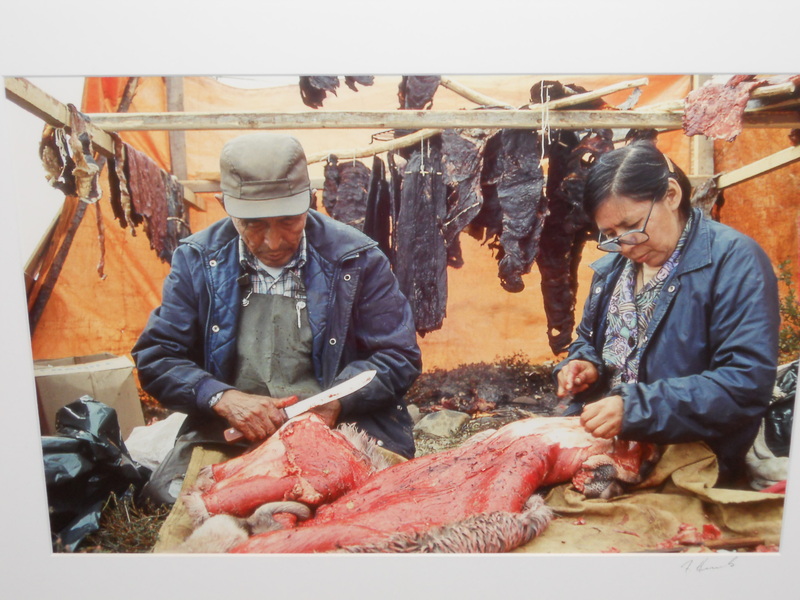 When an animal is hunted and its meat cut up, there’s always the hide to clean to make something useful. 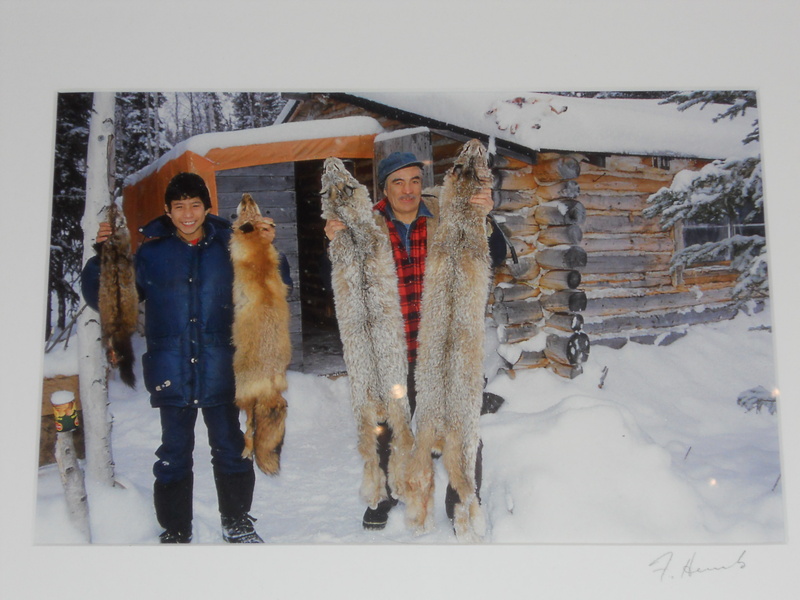 Fur trapping is still alive and well in the north too, although it’s the end of the season around this time of year. Part of the appeal of the north for some people is the chance for rustic living. They picture log cabins and log fireplaces. In Yellowknife, there are all forms of housing: from the mansion-like to the house off the grid, to the cabin near the lake, to the trailer converted into a house, to the shack. There are still people who choose to live in small wooden shacks with no plumbing or heating, right here in the city. Somehow, I think these shacks look appealing only when they’re located out in the wilderness, when there’s no other option. 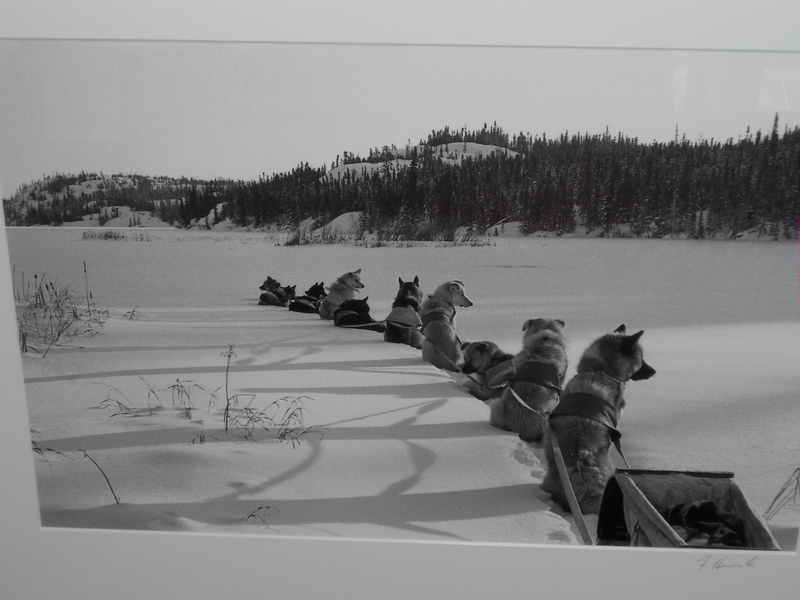 The north can be hypnotic and many of her pictures conveyed that captivating sense of wilderness. What’s more northern than sledding across miles of snow-covered terrain, just you and your dog team? Perhaps a close second to that is covering that same terrain on a snowmobile, which I suppose every northern child learns to drive, or dreams of doing so anyway. Being able to go for a dog-powered or a motor-powered ride is a necessary distraction from the short, dark, frigid days during the depths of winter, when people have to lumber around town in ice fog, wearing astronaut boots and under the weight of parkas. Even though the poor children have to be confined in snow-suits and clunky boots, they can always find something to fascinating to occupy themselves. 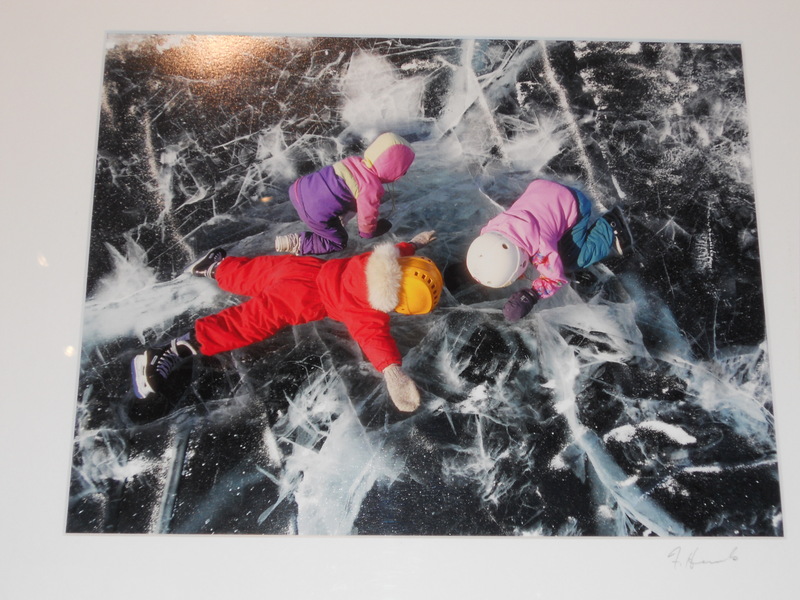 On even a cold day they can find it fun to lie on the ice and strain to make out how far down they can see through it, or count the cracks in it, or try to make more cracks in it. In the north, the professions range from the fancy to the simple: there are geophysicists and there are also fishermen. 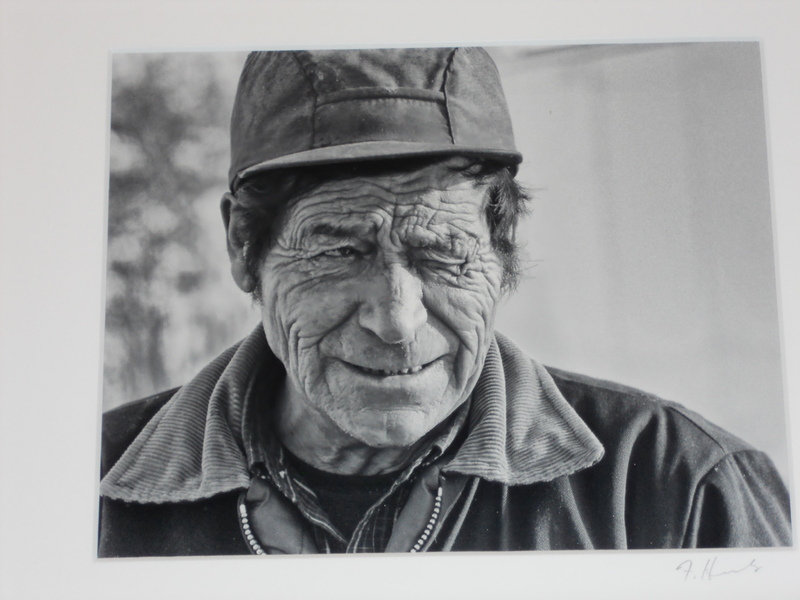 Every wrinkle on this fisherman’s face probably represents a treasure trove of tales, a lifetime of stories, and not only about the ones that got away. The Mackenzie River is a critical transportation artery for the territory, with boats sailing on it during the warmer months and vehicles driving on the ice road formed over it during the colder months. 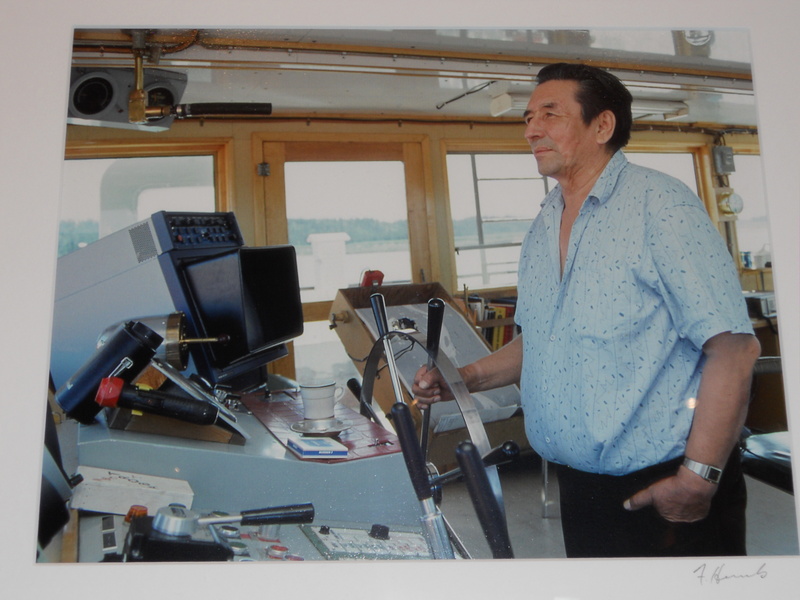 Where there are riverboats there is need for riverboat pilots. It must be a very relaxing job, to go sailing on the river all day. The pace of life in the north is so much slower than down south. Even the houses move slowly. 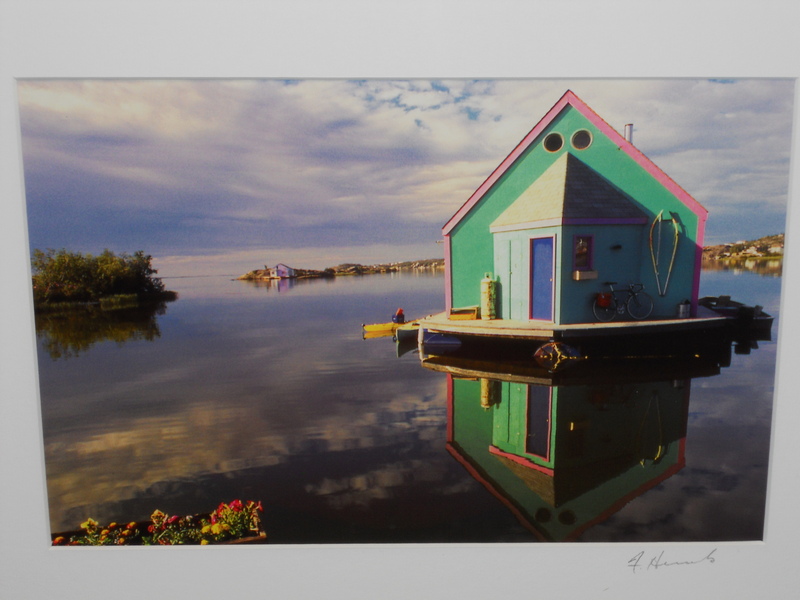 If you live on a houseboat on the Great Slave Lake and you decide that it’s time for a change of scenery, you can just move your house, putter over to another spot. Down south there’s Park ‘n’ Fly. 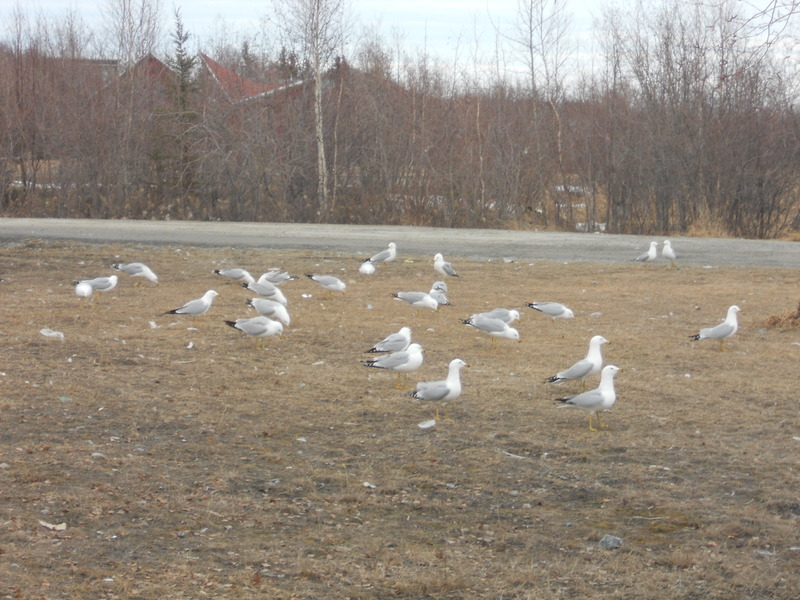 In Yellowknife there’s Park ‘n’ Relax. That’s the thing about life in the ‘Knife: you have the time to enjoy it, and it’s always good.